Normally, I am very careful when I stitch and drink coffee at the same time. But not today! I am not exactly sure what happened….except that the coffee cup missed my mouth and coffee dribbled down my chin and onto Block #2 of Civil War Bride. Yikes! When I start an applique block, the first thing I do is trace the pattern on to the background with a water soluble marker. I trace all of the shapes and I even number them so I know which order to stitch. Sort of like painting by numbers…only with fabric! So when I ran to the sink and rinsed the block under the tap to remove the coffee, I also removed the majority of my markings. Really, just a minor detail. I waited for the block to dry and then I re-traced the pattern and continued on my merry way! First I stitched a few leaves in place…. …and then the bias stem. Next a flower and some buds. My first thought was to make all the flowers purple, but now I think I will make them all different colours! Thank you so much! 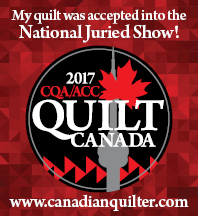 The best part of blogging is connecting with other quilters…like you!! There were a few tense moments…and a few choice words!! Oh how scary! That was a quick save and it looks like everything will be alright now. Thank goodness! I was hand quilting on an appliquéd quilt at church. It was on a expensive (then) hand-dyed beige. One of the older women saw me working on it and came over with a sad face and said “Honey, it’s too bad that you spilled your coffee all over that beautiful piece”. It was a good thing I wasn’t drinking then, or I would have spit all over the quilt from laughing so hard. So funny! I have to ask…why were you hand appliqueing in church? !